The Dutch creative studio Kossmann.dejong signed the installations of three exhibitions at the refurbished Historical Museum of Frankfurt (Germany). The focal point of its intervention is the “snow globe”, showing eight clichéd representations of the city, as seen by eight different artists. When entering a museum, visitors want to live pleasant experiences and to feel emotions. The creatives from Dutch studio Kossmann.dejong are real masters in the design of stimulating installations, such as those we have already seen at the Schiphol Airport (Amsterdam) or at the Communication Museum of Bern (Switzerland), to name but a few. Kossmann.dejong was involved in the refurbishing of the Historical Museum of Frankfurt, which was born as a museum exploring the history of the city and that today has become the Urban Museum of the “Mainmetropole”, the fifth largest city by population in Germany, with over five million inhabitants. The Museum is located in the centre of Frankfurt, between the City Hall and the Main river, and has been enlarged and restyled. 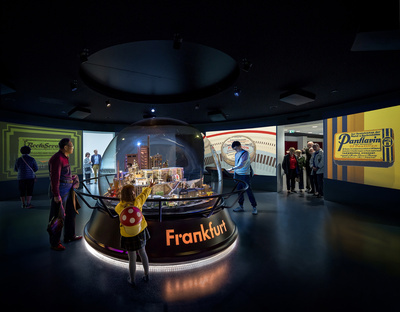 Its exhibition concept has been renewed as well, and the museum has become a place of information, reflection and discussion about Frankfurt, offering explanations and backgrounds on the history of the city. Kossmann.dejong designed three exhibitions, of which one is temporary and two are permanent, that focus on several aspects of Frankfurt and that are addressed to all of the city inhabitants and visitors. For the exhibition “Typically Frankfurt”, which connects the entrance with the new building, Kossmann.dejong designed a “snow globe”, a typical kitsch souvenir that, let’s admit it, we all love so much. 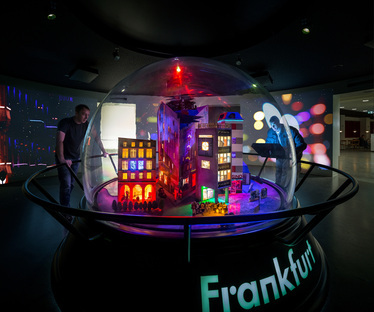 This glass globe shows the history of Frankfurt from eight points of view that are not displayed in a chronological order, but according to the most typical stereotypes of the city. Eight international artists have been invited to represent these clichés, that are based on the research made by the museum itself, and that range from the “city of finance” to the “city of crime” and the “city of perpetual construction sites”. It works just like a jukebox: visitors can choose which of these models they want to see. The model is then placed inside the glass globe by a robotic arm and accompanied by an animated projection on the walls, realised by the Shoshso studio of Amsterdam, that provides additional information, creating an immersive experience. While the setting can only be chosen while inside the museum, the snow globe can also be seen outside the museum, to create a debate and raise interest. The Historical Museum of Frankfurt is open to all visitors, to let them really get to know the history, but also the emotions and the concepts at the basis of one of the most emblematic cities of Germany.